1 of 4 Coat slow cooker bowl with nonstick cooking spray; arrange salmon in it, tucking the thin ends of fillets underneath. Sprinkle with garlic. 2 of 4 Stir together mustard, honey, vinegar and dill. Place 2 tablespoons in a small bowl and stir in onion and broth. Reserve remaining mustard mixture for later. Drizzle broth mixture over salmon. Cover; cook on HIGH for 11/2 hours or LOW for 3 hours. 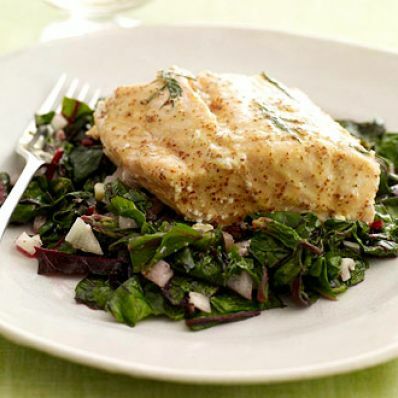 3 of 4 Add the Swiss chard around or on top of salmon for final 15 minutes of cooking on HIGH or final 30 minutes on LOW; stir halfway through. 4 of 4 Carefully remove salmon from slow cooker; set aside and keep warm. Stir 1 tablespoon mustard mixture into Swiss chard. Serve with remaining mustard sauce.